Will ash trees follow the fate of elm trees? About 30 years ago my neighbor's kid won a college scholarship for his sketch of the dead elm trees in front of my house marked with big red X's. Now I fear for the the giant ash trees across the street in Como Park. Apparently the emerald ash borer beetle (EAB) has been damaging our ash trees for years. The EAB were officially discovered in St. Paul's Hampdem Park mid May, 2009. Minnesota has the second highest number of ash trees in the nation after Maine. Many of them were planted to replace trees lost to Dutch elm disease a generation ago. Where can I find information about the emerald ash borer? The Minnesota Department of Agriculture (MDA) website has excellent information. Another, multinational website with the lastest information about EAB is emeraldashborer.info. I also recommend the University of Minnesota Extension website page which answers questions about ash trees and emerald ash borer beetles. What is Saint Paul doing for its ash trees? "Hahm plans to start a campaign of removing affected ash trees at a rate of 3,000 a year and replacing them with other trees the following spring. In St. Paul's St. Anthony neighborhood, 67 trees already have been cut down. Hahm said he plans to apply immediately for nearly $2.8 million in state and federal money to fight the infestation." 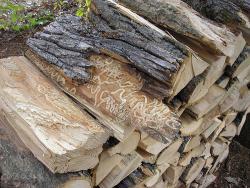 This link will take you to the St Paul website page on emerald ash borer info.